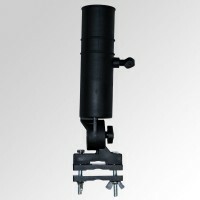 Mounting bracket included with purchase. CaddyTrek’s new golf score card clip board easily attaches to the push or sensor bar of the CaddyTrek unit. 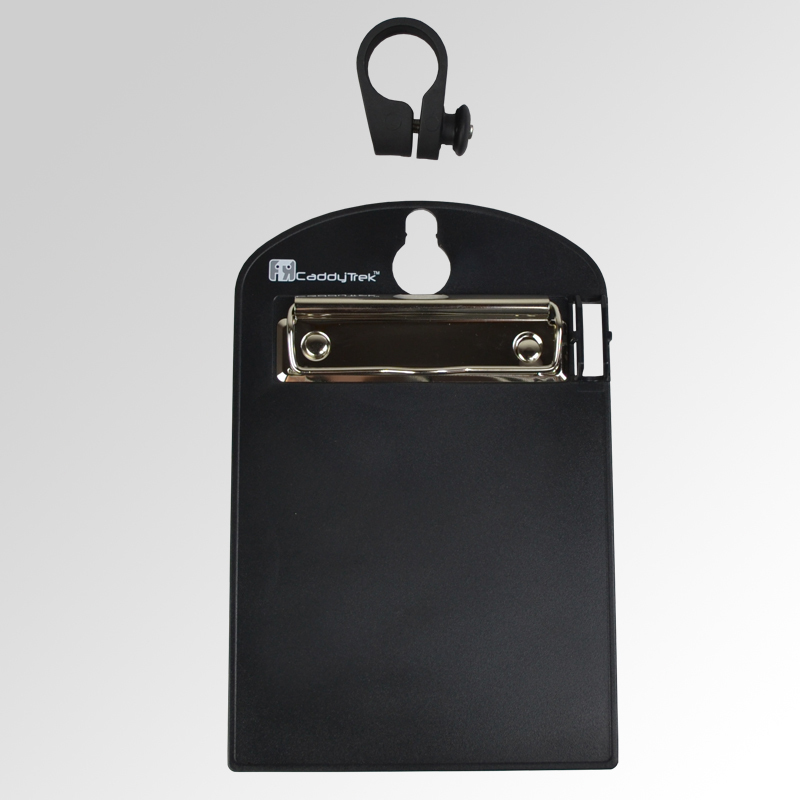 The clip securely holds your score card, course map or notes and the clip board can be easily snapped off of the mounting bracket during play. Installation of the mounting bracket is a breeze. 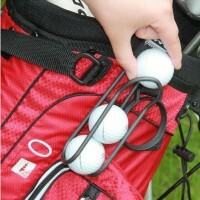 Motogolf.com wants to make sure all customers are happy with their purchase. For that reason, you may return any of our items for a refund less 30% restocking charge. This charge covers the fee charged by the logistics company for checking and restocking of the returned product. Also included in this charge is the original shipping cost by Federal Express or UPS, and credit card processing charges charged by mal's e-commerce and paypal on both the original debit charge and the subsequent credit payment. The items must be returned within 5 days of purchase and the items must be in new condition with all factory packaging and literature in its original condition. If the items show obvious sign of use it will not be accepted and no refund will be issued. The items must be post-marked no later than 5 days from order date. No exceptions. You MUST contact us via email or telephone prior to returning any product. Many of our products are returned directly to our manufacturer, not to us. If any these items is returned to us, it maybe forwarded to the manufacturer at your expense. Most items we sell have warranties from the manufacturer, so after 5 days you should deal directly with them. Please contact the manufacturer via telephone or email. You can also contact them through their website. We do not act as agents on their behalf. The manufacturer will not be able to issue a full refund since they never received the full retail price. Any refund beyond the dealer’s return policy will be at their full discretion. This Agreement contains the terms and conditions that apply to your purchase from FTR Systems Inc. named on the invoice (Caddytrek) that will be provided to you ("Customer") on orders for Caddytrek products (“Products”) sold in the United States. By accepting delivery of the Products described on that invoice, Customer agrees to be bound by and accepts these terms and conditions. THESE TERMS AND CONDITIONS APPLY (i) UNLESS THE CUSTOMER HAS SIGNED A SEPARATE PURCHASE AGREEMENT WITH FTR Systems Inc., IN WHICH CASE THE SEPARATE AGREEMENT SHALL GOVERN; OR (ii) UNLESS OTHER FTR Systems STANDARD TERMS APPLY TO THE TRANSACTION. These terms and conditions are subject to change without prior written notice at any time, in FTR Systems sole discretion. Terms of payment are within FTR Systems’s sole discretion, and unless otherwise agreed to by FTR Systems payment must be received by FTR Systems prior to FTR Systems acceptance and delivery of an order. Payment for the products and services and support will be made by credit card, wire transfer, or some other prearranged payment method unless credit terms have been agreed to by FTR Systems. Invoices are due and payable at the time of order and the date of the invoice. The FTR Systems/Caddytrek online e-Commerce system will charge a credit card immediately upon completion of an order through our certified secured payment processor company and merchant bank. FTR Systems guarantees a full and immediate refund in case of backorder situations or pre-shipment cancellations upon customer request. FTR Systems may invoice parts of an order separately. Orders are not binding upon FTR Systems until accepted by FTR Systems. Any quotations given by SpaCom will be valid for the period stated on the quotation, or if published on the internet prices are guaranteed for one calendar week from the date of publication. Prices are subject to change without notice and might vary outside the Continental United States. Customer agrees to pay interest on all past-due sums at the current interest rate for credit card debt. Discounts are applied as agreed between the Customer and FTR Systems Inc/Caddytrek. Separate charges for shipping and handling will be shown on FTR Systems invoice(s), if applicable. Standard shipping charges within the continental U.S. include shipping via UPS or Fed Ex Ground or similar service. Customer may choose alternate carrier at additional charges. International shipments can be made with a mutually agreed carrier and at the customer's expense. Unless Customer provides SpaCom with a valid and correct tax exemption certificate applicable to the product ship-to location prior to FTR Systems acceptance of the order, the Customer is responsible for sales and all other taxes associated with the order, however designated, except for FTR Systems franchise taxes and taxes on FTR Systems net income. If applicable, a separate charge for taxes will be shown on FTR Systems Inc. invoice. Title to products passes from FTR Systems to Customer on shipment from FTR Systems facility. Loss or damage that occurs during shipping by a carrier selected by FTR Systems Inc. is FTR Systems responsibility. Loss or damage that occurs during shipping by a carrier selected by Customer is Customer's responsibility. THE LIMITED WARRANTIES APPLICABLE TO FTR Systems Inc. 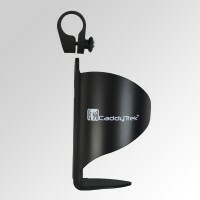 BRANDED PRODUCTS ARE INCLUDED IN THE DOCUMENTATION ALONG WITH THE PRODUCTS AS WELL AS ON OUR WEBSITE WWW.CADDYTREK.COM . THERE ARE NO WARRANTIES FOR SERVICES. FTR Systems MAKES NO EXPRESS WARRANTIES EXCEPT THOSE STATED IN THIS SECTION AND IN SPACOM'S APPLICABLE WARRANTY STATEMENT IN EFFECT ON THE DATE OF THE INVOICE. ANY SUCH WARRANTIES WILL BE EFFECTIVE, AND SPACOM WILL BE OBLIGATED TO HONOR ANY SUCH WARRANTIES, ONLY UPON SPACOM'S RECEIPT OF PAYMENT IN FULL FOR THE ITEM TO BE WARRANTED. ANY WARRANTY WILL BE VOIDED IN ITS ENTIRETY, IF A CUSTOMER HAS DISPUTED A CREDIT CARD CHARGE OR OTHER FORM OF PAYMENT RESULTING IN SPACOM NOT HAVING RECEIVED FULL PAYMENT. SPACOM DISCLAIMS ALL OTHER WARRANTIES, EXPRESS OR IMPLIED, INCLUDING WITHOUT LIMITATION IMPLIED WARRANTIES OF' MERCHANTABILITY AND FITNESS FOR A PARTICULAR PURPOSE. SPACOM'S RESPONSIBILITY FOR WARRANTY CLAIMS IS LIMITED TO REPAIR AND REPLACEMENT AS SET FORTH IN SPACOM'S APPLICABLE WARRANTY STATEMENT IN EFFECT ON THE DATE OF THE INVOICE. WE WILL NOT PAY FOR: LOSS OF USE OF YOUR PRODUCT OR PROPERTY DAMAGE CAUSED BY YOUR GOLF TROLLEY PRODUCT OR ITS FAILURE TO WORK; ANY SPECIAL INCIDENTAL OR CONSEQUENTIAL DAMAGES RESULTING FROM PERFORMANCE OR FAILURE TO PERFORM UNDER THIS AGREEMENT, OR FROM THE FURNISHING, PERFORMANCE OR USE OF ANY GOODS OR SERVICE SOLD PURSUANT HERETO, WHETHER DUE TO A BREACH OF CONTRACT, BREACH OF WARRANTY, NEGLIGENCE, MISUSE OR MODIFICATION OF THE PRODUCT OR OTHERWISE NEITHER YOU NOR SPACOM SHALL HAVE ANY LIABILITY TO THE OTHER FOR INDIRECT OR PUNITIVE DAMAGES, OR FOR ANY CLAIM BY ANY THIRD PARTY EXCEPT AS EXPRESSLY PROVIDED HEREIN. FTR Systems Inc./Caddytrek reserves the right to modify its warranty at any time, in its sole discretion. FTR Systems products that are purchased directly from FTR Systems or by any of FTR Systems/Caddytrek authorized dealers by an end-user Customer may be returned by Customer in accordance with FTR System/Caddytrek “Satisfaction Return Policy" in effect on the date of the invoice. Unused items in new condition and in original packaging only may be returned for full credit within 7 days of receipt of product, excluding shipping and handling charges. Customer is fully responsible for shipping cost of returned items. Please contact us at 1-781-213-3014 or www.caddytrek.com/contact-us/with an order number and reason for the return before shipping the item back. All returns must have an assigned Return Authorization number clearly written on the outside label to be accepted. It is recommended that you insure the item before returning it. For returns after the initial return period and used caddies for up to 30 days after the original purchase date a restocking charge of 20-25% of the original purchase price (depending on condition) excl. shipping & handling charges applies. Customer is fully responsible to cover original and return shipping and insurance charges. Return acceptance after 30 days after the original purchase date are at FTR Systems sole discretion and subject to depreciation fees assessed by our technical staff. From time to time, FTR Systems Inc/Caddytrek may, in its sole discretion, exchange products or portions of a product. Any exchanges will be made in accordance with FTR Systems/Caddytrek exchange policies in effect on the date of the exchange. SpaCom's policy is one of ongoing product update and revision. SpaCom may revise and discontinue products at any time. SpaCom will ship products that have the same or better functionality and performance of the products ordered, but changes between what is shipped and what is described in a specification sheet, website, manual or catalogue are possible during a model year. SpaCom reserves all rights to modify and upgrade components during a model year. All parts are factory new, unused unless otherwise described or ordered by the Customer. FTR Systems Inc. DOES NOT ACCEPT LIABILITY BEYOND THE REMEDIES SET FORTH HEREIN, INCLUDING ANY LIABILITY FOR PRODUCTS NOT BEING AVAILABLE FOR USE, OR THE PROVISION OF SERVICES AND SUPPORT FTR Systems WILL NOT BE LIABLE FOR LOST PROFITS, LOSS OF BUSINESS OR OTHER CONSEQUENTIAL, SPECIAL, INDIRECT OR PUNITIVE DAMAGES, EVEN IF ADVISED OF THE POSSIBILITY OF SUCH DAMAGES, OR FOR ANY CLAIM BY ANY THIRD PARTY EXCEPT AS EXPRESSLY PROVIDED HEREIN. THIS LIMITATION OF LIABILITY APPLIES BOTH TO PRODUCTS AND SERVICES AND SUPPORT CUSTOMER RECEIVES UNDER THIS AGREEMENT. CUSTOMER AGREES THAT FOR ANY LIABILITY RELATED TO THE PURCHASE OF PRODUCTS OR SERVICES BUNDLED WITH THE PRODUCTS, FTR Systems IS NOT LIABLE OR RESPONSIBLE FOR ANY AMOUNT OF DAMAGES ABOVE THE AGGREGATE DOLLAR AMOUNT PAID BY CUSTOMER FOR THE PURCHASE OF PRODUCTS UNDER THIS AGREEMENT. CUSTOMER AGREES THAT FOR ANY LIABILITY RELATED TO THE PURCHASE OF SERVICES NOT BUNDLED WITH PRODUCTS UNDER THIS AGREEMENT, FTR Systems IS NOT LIABLE OR RESPONSIBLE FOR ANY AMOUNT OF DAMAGES ABOVE THE AGGREGATE DOLLAR AMOUNT PAID BY CUSTOMER FOR THE PURCHASE OF SERVICES UNDER THIS AGREEMENT. Customer agrees to comply with all applicable laws and regulations of the United States. FTR Systems/Caddytrek will provide general telephone service and support to Customers in the United States, and in selected international countries in accordance with the then-current service and support policies and conditions in effect. However, FTR Systems/Caddytrek support personnel may not be able to understand or resolve any given problem, and hereby excludes any obligations or liabilities arising from a given problem not solved by FTR Systems/Caddytrek. FTR Systems/Caddytrek has no obligation to provide service or support until FTR Systems/Caddytrek has received full payment for the product or services and support that Customer purchased. The parties will attempt to resolve any claim, or dispute or controversy (whether in contract, tort or otherwise) against FTR Systems Inc/Caddytrek, its agents, employees, successors, assigns or affiliates (collectively for purposes of this paragraph, FTR Systems) arising out of or relating to this Agreement, FTR Systems/Caddytrek advertising, or any related purchase (a "Dispute") through face to face negotiation with persons fully authorized to resolve the Dispute or through mediation utilizing a mutually agreeable mediator, rather than through litigation. If the parties are unable to resolve the Dispute through negotiation or mediation within a reasonable time after written notice from one party to the other that a Dispute exists, the Dispute will be settled by binding arbitration in accordance with the then current CPR Rules for Non-Administered Arbitration. The Arbitration will be conducted before three (3) independent and impartial arbitrators. FTR Systems will appoint one (1) arbitrator and the other party or parties will appoint one (1) arbitrator. The two (2) appointed arbitrators will then select a third arbitrator, who shall be the presiding arbitrator. The arbitration hearing shall take place in Massachusetts and will be governed by the United States Federal Arbitration Act to the exclusion of any inconsistent state laws. The arbitrators shall base their award on the terms of this Agreement, and will follow the law and judicial precedents that a United States District Judge sitting in Suffolk County, Massachusetts would apply to the Dispute. The arbitrators shall render their award in writing and will include the findings of fact and conclusion of law upon which their award is based. Judgment upon the arbitration award may be entered by any court of competent jurisdiction. The existence or results of any negotiation, mediation or arbitration will be treated as confidential. Notwithstanding the foregoing, either party will have the right to obtain from a court of competent jurisdiction a temporary restraining order, preliminary injunction or other equitable relief to preserve the status quo or prevent irreparable harm, although the merits of the underlying Dispute will be resolved in accordance with this paragraph. What is covered? Any defect in material and workmanship resulting from personal, normal use in accordance with the owner’s manual. The battery is covered for 90 days under normal operating conditions.The wheels are covered for defect only and not for excessive wear. Who gets the warranty? The warranty is limited to the consumer who originally purchased the product. Geographic scope: This warranty applies only to products purchased in the United States and Canada and Western Europe from an authorized Caddytrek dealer or distributor. International shipping cost for product exported from the country of original purchase are not covered by warranty. What we will do: If your Caddytrek is defective, we will send you replacement parts, repair it or, at our discretion, replace it at no charge to you. LIMITATIONS & LIABILITY: IMPLIED WARRANTIES, INCLUDING THOSE OF FITNESS FOR A PARTICULAR PURPOSE AND MERCHANTABILITY ARE LIMITED TO ONE YEAR FROM DATE OF PURCHASE. WE WILL NOT PAY FOR: LOSS OF USE OF YOUR PRODUCT OR PROPERTY DAMAGE CAUSED BY YOUR GOLF TROLLEY PRODUCT OR ITS FAILURE TO WORK; ANY SPECIAL INCIDENTAL OR CONSEQUENTIAL DAMAGES RESULTING FROM PERFORMANCE OR FAILURE TO PERFORM UNDER THIS AGREEMENT, OR FROM THE FURNISHING, PERFORMANCE OR USE OF ANY GOODS OR SERVICE SOLD PURSUANT HERETO, WHETHER DUE TO A BREACH OF CONTRACT, BREACH OF WARRANTY, NEGLIGENCE, MISUSE OR MODIFICATION OF THE PRODUCT OR OTHERWISE NEITHER YOU NOR SPACOM SHALL HAVE ANY LIABILITY TO THE OTHER FOR INDIRECT OR PUNITIVE DAMAGES, OR FOR ANY CLAIM BY ANY THIRD PARTY EXCEPT AS EXPRESSLY PROVIDED HEREIN. How to get warranty service? To get warranty service for your trolley you must provide proof of date and place of purchase of the product. 1. Do-It-Yourself Service: Call or see your authorized dealer to diagnose the problem and make arrangements to get replacement parts. 2. Service from authorized dealer: If repair cannot be performed by customer, request your authorized dealer to repair your product. We suggest that you retain the original packing material in the event you need to ship your product back to one of our Service Centers. Upon contacting an authorized dealer or us we will determine the appropriate above described service options under this warranty. What this warranty does not cover: This warranty does not cover wear parts, such as rubber tire treads or remote control batteries. The warranty does not cover any defects resulting from accidents, damage while in transit to our service locations, or damage resulting from alterations, misuse or abuse, lack of proper maintenance, water damage due to hosing down or power washing product or submerged contact with water hazards, lakes or other water bodies, any loss of control of the unit resulting in equipment or consequential damage, unauthorized repair or modifications of the product, affixing any attachment not provided with the product, overloading of the product, fire, flood, or acts of God, or failure to follow the instructions in the Owner’s manual. This warranty also does not cover any international shipping cost due to exportation of the cart from the country of original purchase. This warranty is the only one we will give on your product, and it sets forth all our responsibilities regarding your product. There are no other express warranties! Please read our legal notice and terms and conditions at www.batcaddy.com as they may contain additional regulations and legal obligations or restrictions between the parties.